Climate change models could have a thing or two to learn from termites and fungi, according to a new study released this week. For a long time scientists have believed that temperature is the dominant factor in determining the rate of wood decomposition worldwide. Decomposition matters because the speed at which woody material are broken down strongly influences the retention of carbon in forest ecosystems and can help to offset the loss of carbon to the atmosphere from other sources. 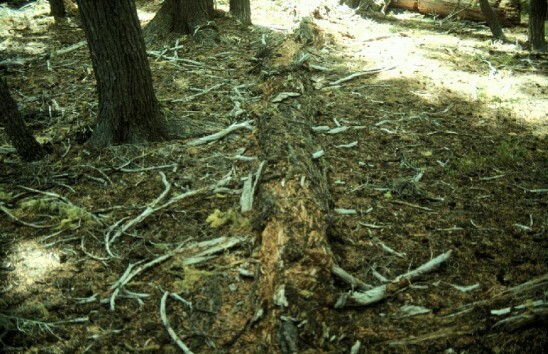 That makes the decomposition rate a key factor in detecting potential changes to the climate. But scientists from Yale, the University of Central Florida and SUNY Buffalo State found that fungi and termites, which help break down wood, may play a more significant role in the rate of decomposition than temperature alone. The group’s findings appear in this week’s edition of the journal Nature Climate Change. So how did scientists originally come up with temperature as the main factor in decomposition? It has to do with data and math. Scientists most often construct a model based on the average decomposition rates of sites that are in close proximity to each other. In this case, it appears that each local number matter because they reflect the activity of fungi and termites. The team suggests that scientists need to embrace the variability found across data collected from many different sites instead of averaging it all together to create better models with more accurate predictions. The team reached this conclusion after running a 13-month experiment. They distributed 160 blocks of pine tree wood across five sub-regions of temperate forest in the eastern U.S. — from Connecticut to northern Florida — and then monitored the decay that occurred. They selected similar forest types, hardwood deciduous forests, to focus on major differences in climate across the regional gradient. (The average annual temperature in southern New England is about 11 degrees Celsius cooler than Florida.) Within each of the five sub-regions they placed the wood blocks in different types of terrain to evaluate the effects of local versus regional factors as controls on decomposition. After 13 months, they measured how much wood had been lost, whether to the consumption of fungi growing on the wood or to termites consuming the wood. According to their analysis, local-scale factors explained about three quarters of the variation in wood decomposition, while climate explained only about one quarter, contrary to the expectation that climate should be the predominant control. The team’s recommendation: collect more data at local sites and improve our understanding of how local conditions affect the organisms that drive decomposition, because they could significantly improve the effectiveness of climate change projections. Co-authors of the study include: Robert J. Warren II from SUNY Buffalo State; Petr Baldrian from the Academy of Sciences of the Czech Republic; Thomas W. Crowther, Daniel S. Maynard and Emily E. Oldfield from Yale; William R. Wieder, from the National Center for Atmospheric Research in Boulder, CO and Stephen A. Wood from Columbia University. The National Science Foundation and Yale Climate & Energy Institute funded the research. King is an assistant professor of biology at UCF. He has multiple degrees including a Ph.D in entomology from the University of Florida, a master’s degree in education from Tufts University and a bachelor’s degree in biology from Tufts. He is an expert on termites and ants and his work is currently funded by the National Science Foundation to study the ecology of ants in Florida and the southern US.